Last Thursday we were tasked with replacing some steps at Rowhill; even though we had a brief snow shower in the morning it did not deter our volunteers. In the cold we soon warmed up ripping out the old steps, and creating a template for the replacement. This required the removal of a very stubborn rotten stump and lots of measuring. Many passing walkers commented about how excited they were for improved steps. Luckily we had the expertise of Paul and Mike so it was guaranteed the steps would look great. Due to narrow access to the steps we could only transport one load of aggregate to fill the steps on the day and therefore the steps had to be closed temporarily. Laura and I returned on Monday to complete the steps and once again had many pleased walkers complimenting our work after testing them out. The finished result ! If you would like to test the steps out yourself you can find them here. Many thanks to Paul, Mike, Janet, Sarah, Eric and John. Further thanks to Laura and Matt for helping with accessing the site and bringing the aggregate on the tractor. 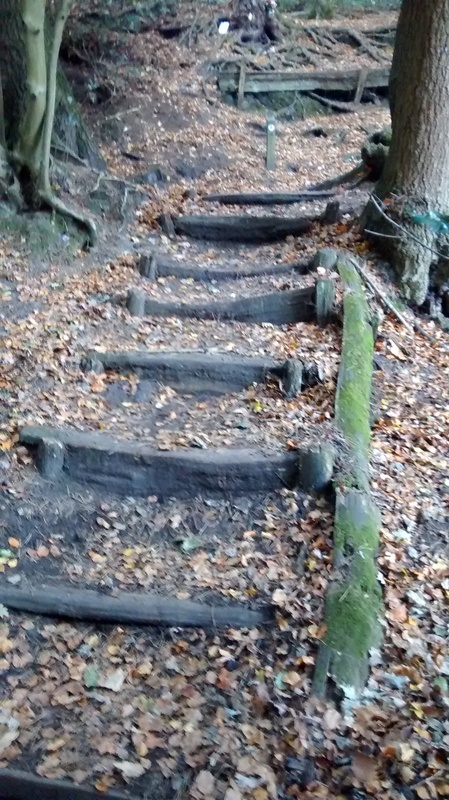 This entry was posted in Access, General Information, Rowhill, Volunteers and tagged BVCP, Path, Rowhill, steps, Thursday Task, Volunteers, volunteers thanks. Bookmark the permalink.